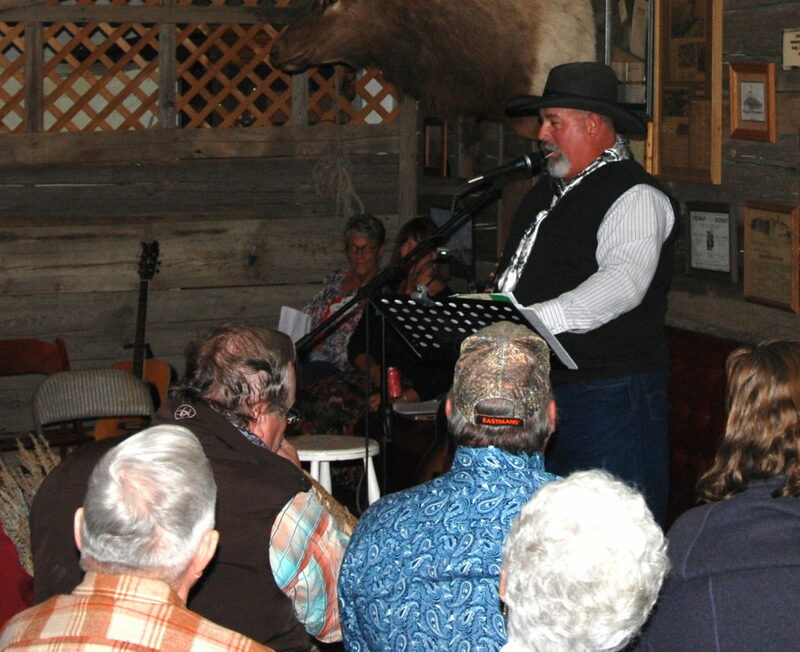 Vince Royer (l), Linda Lou Crosby(c), Alice Cameron(r), and Boots’ campfire. It was definitely a full evening of events. 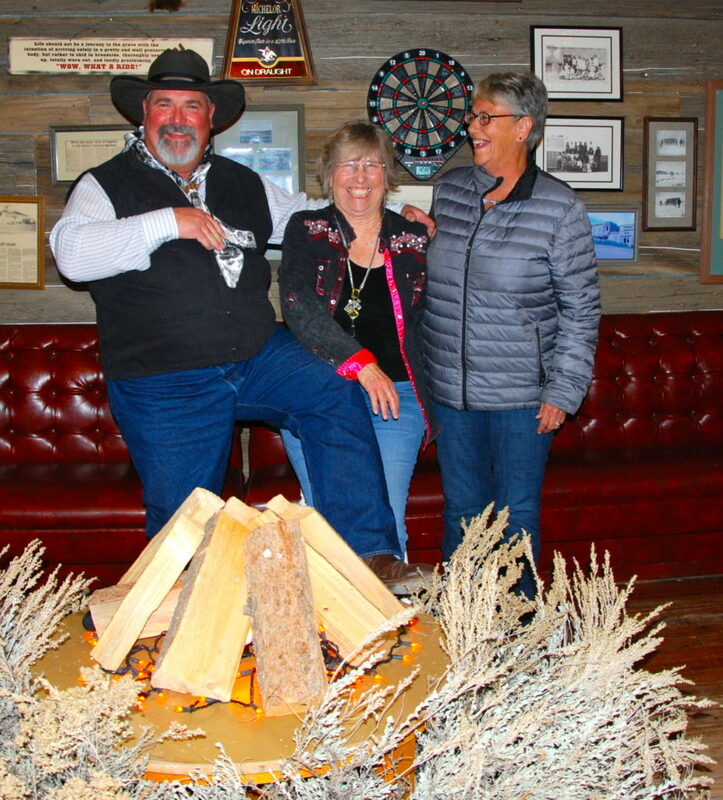 After great grub, June Nygren (co-owner of the Jersey Lilly with Boots Kope) sent the crowd out, while a select few set up the campfire (which Boots had created) and chairs in a horseshoe shape for the audience to gather round the entertainers. 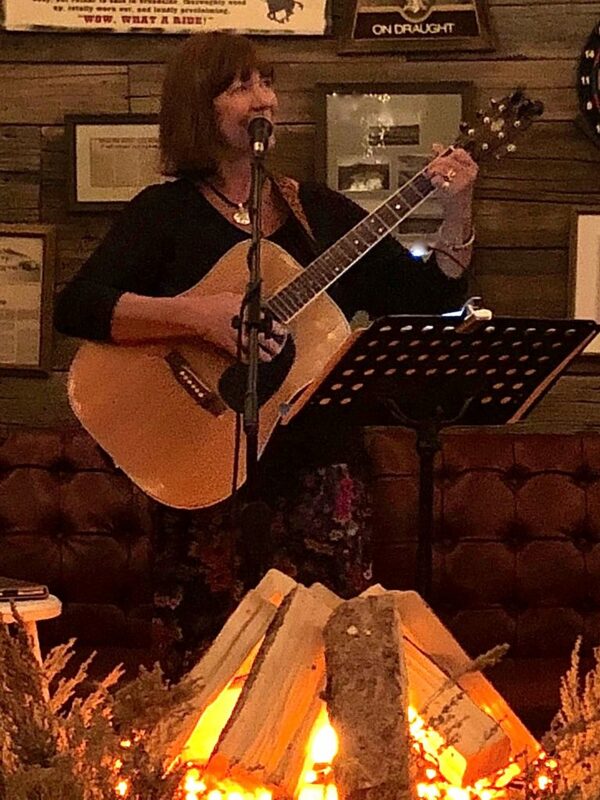 The melodious Sandy Matheny Fennessy, from Whitefish, MT, drew the guests in with a beautiful rendition of “The Campfire Waltz”, followed by a song she wrote about Ingomar and the Jersey Lilly, “Two Old Cowboys and Three Guitars”. 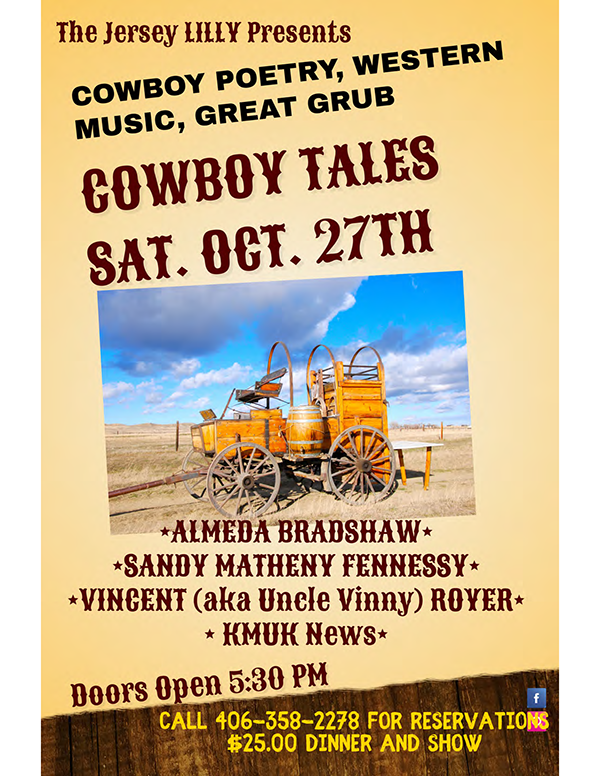 Sandy sings with a band called “Cowboy Country and the Gold Dust Girls” and if you find out they are coming to your town – go see them! 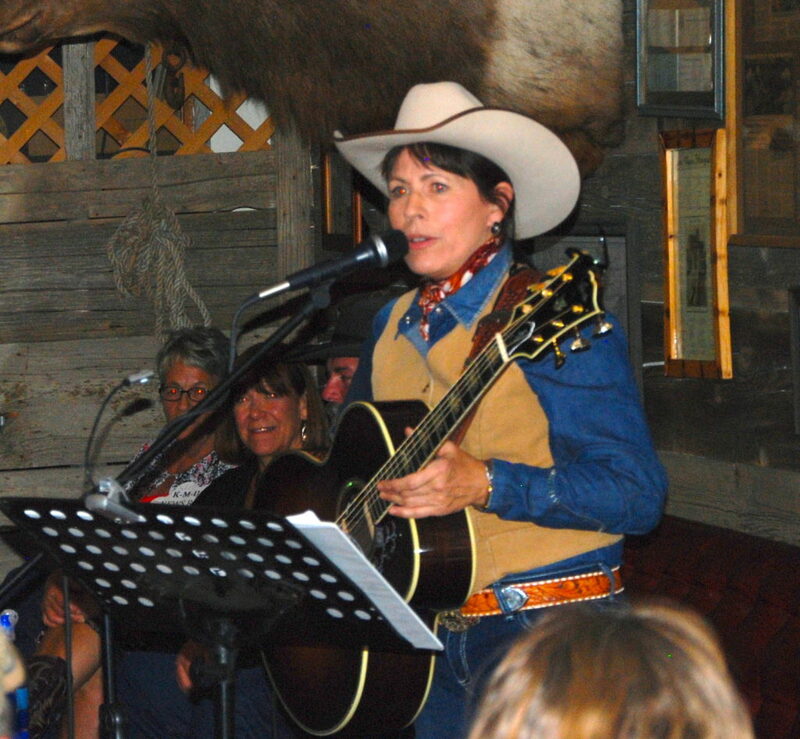 For this year’s “Cowboy Tales”, straight from performing during the NILE, singer-songwriter Almeda Bradshaw shared her program, offered through Humanities Montana, “Into the Sunset: The Forgotten Cowgirl Singers”. As Bradshaw explains, “Dale Evan’s success as Queen of the West is owed to a century of cowgirls in show business. 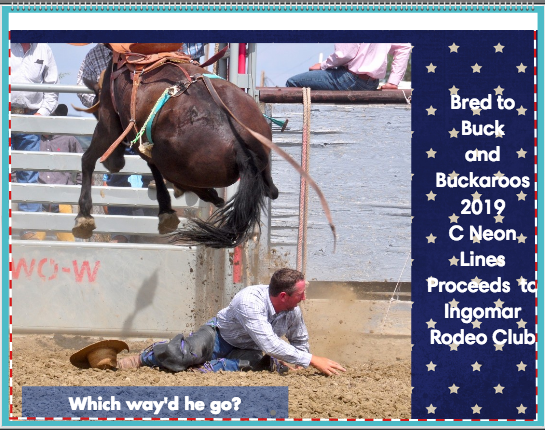 From Mary Ann Whittaker’s horseback exhibitions in the 1850s, to the Wild West Shows and vaudeville acts of the early 1900s, to the pioneer radio and recording artists of the 1920s, forgotten women entertainers wore buckskins and boots while yodeling their way into America’s heart.” And Almeda wowed the crowd with wonderful songs from these entertainers, and added some of her other repertoire as well. Bradshaw is not only a grand singer-songwriter, but a terrific musician. Bradshaw had the evening’s guests traveling back in time to the old west, helping her yodel, and pretty much being mesmerized by the talent she brought to the evening. Bradshaw led the audience and the cast (except for Bertha Gadabout who retreated to a corner and wrote news stories) in singing, “Happy Trails” at the close of the show.